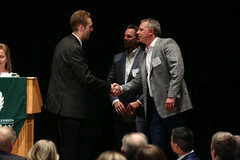 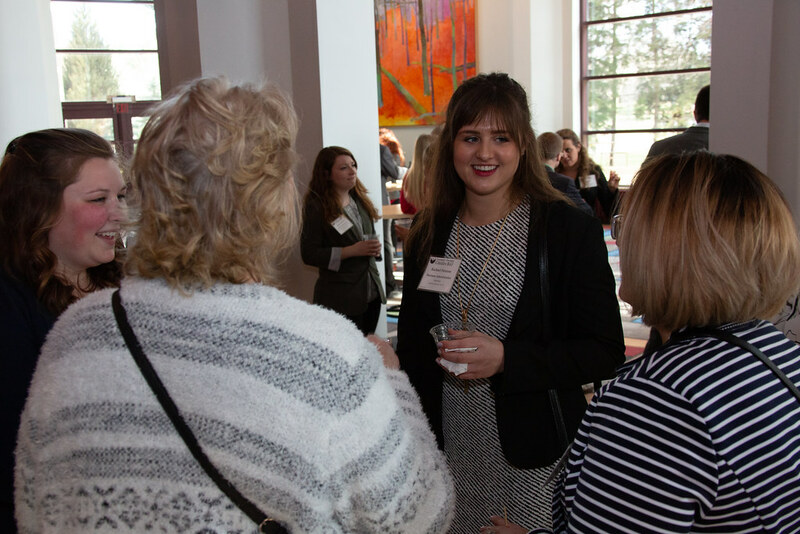 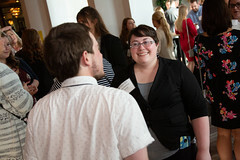 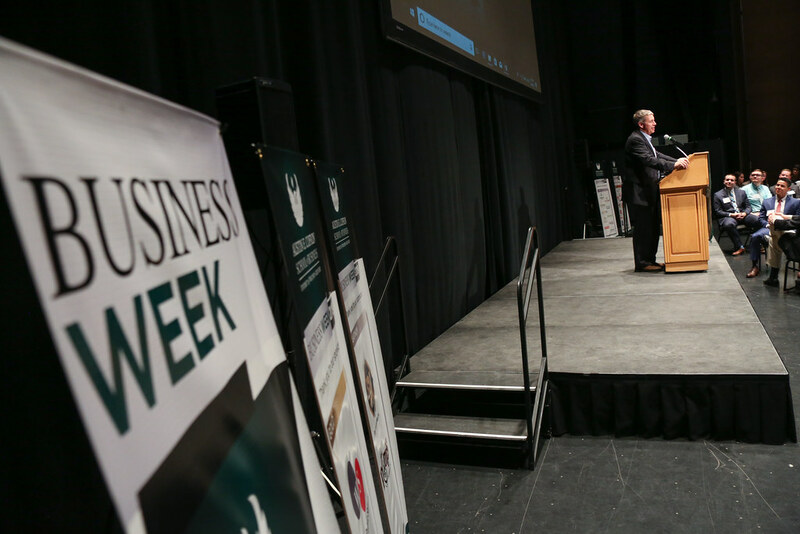 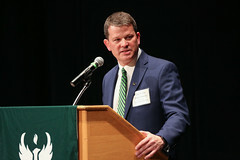 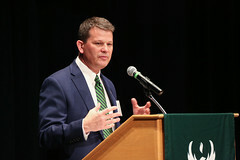 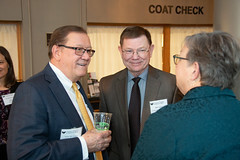 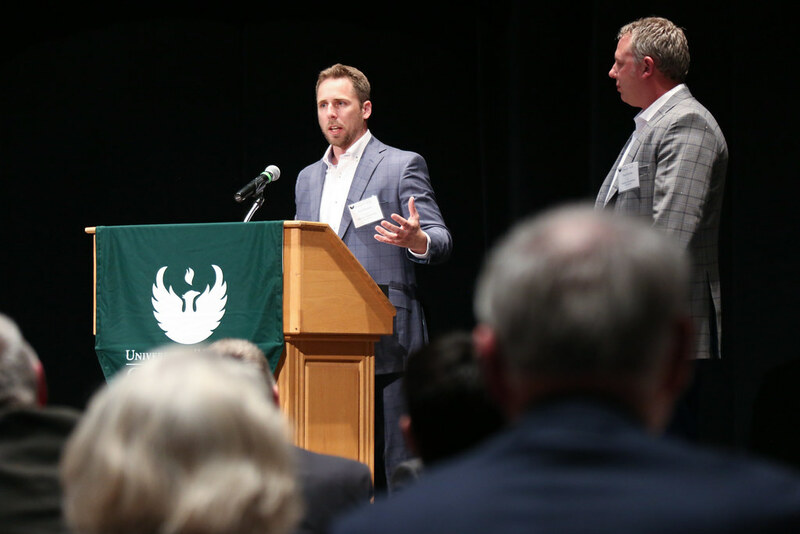 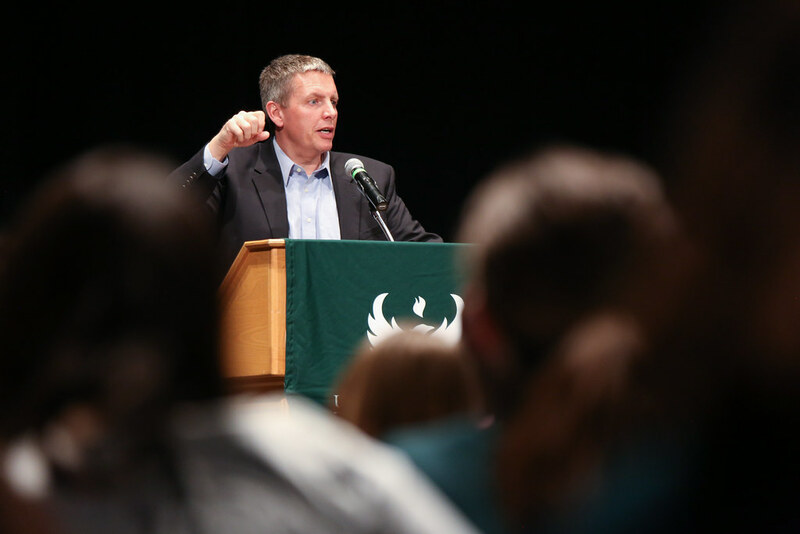 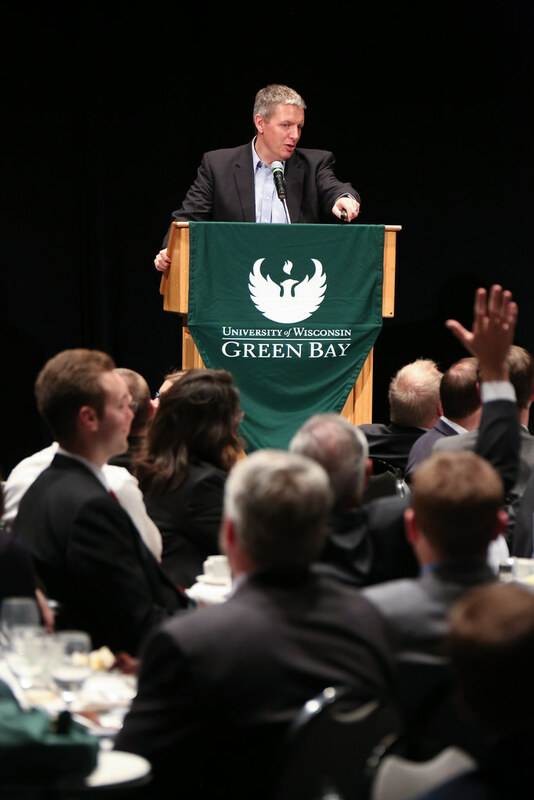 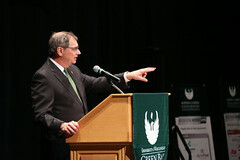 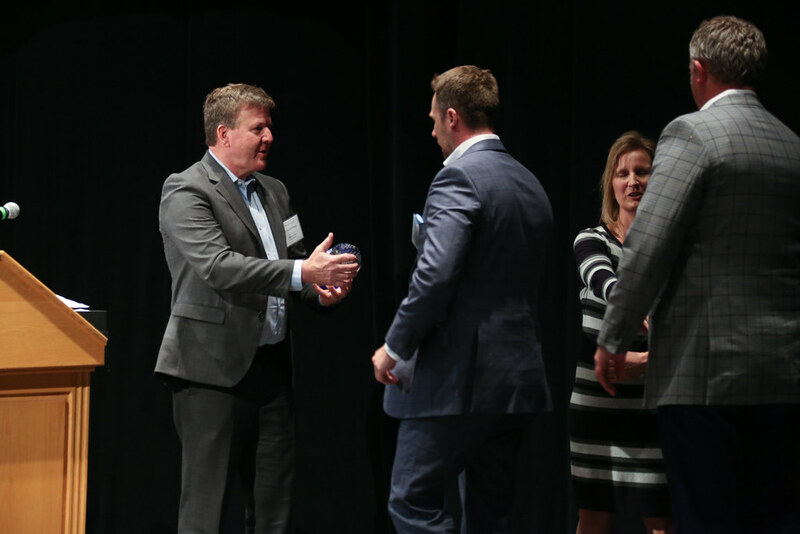 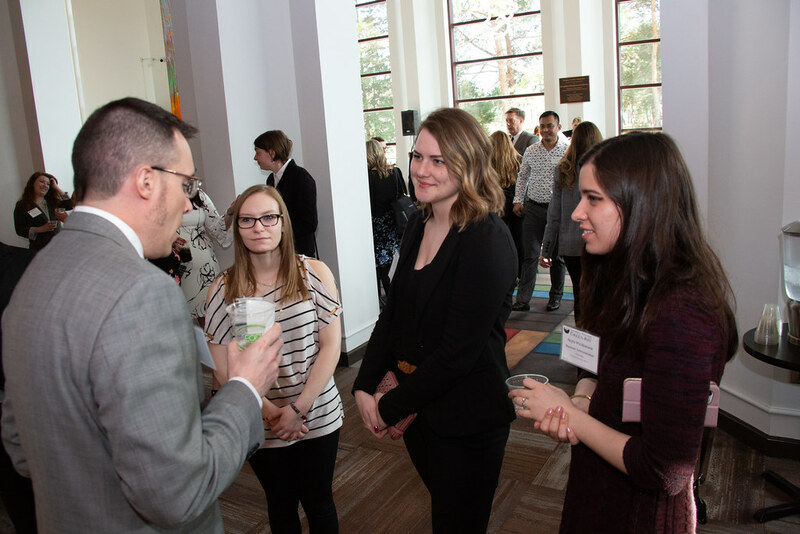 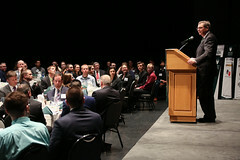 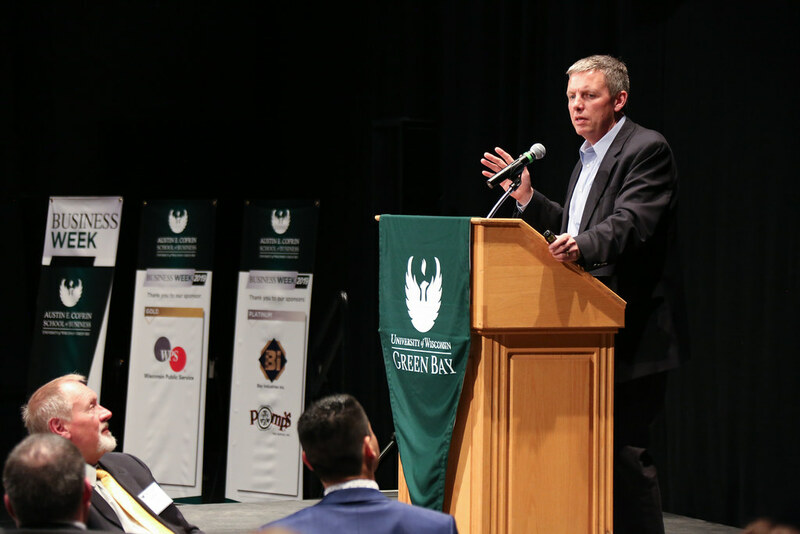 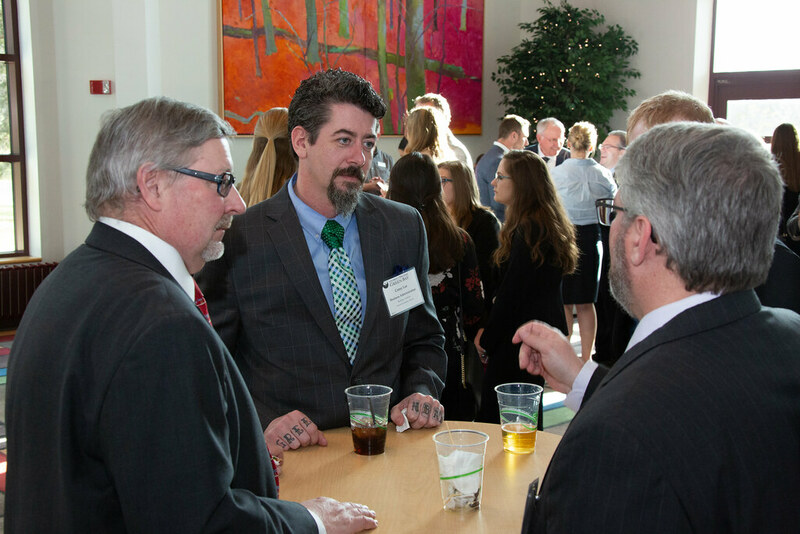 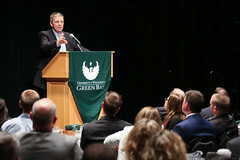 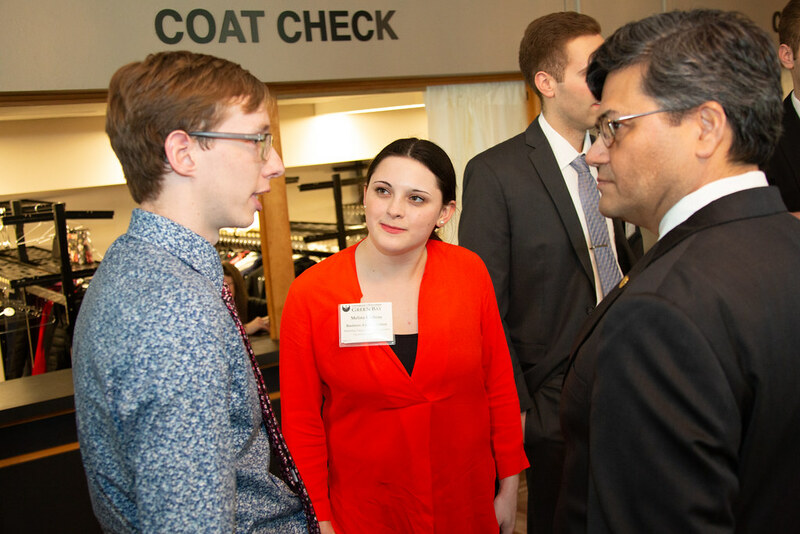 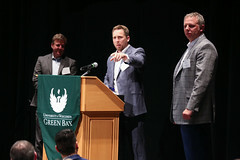 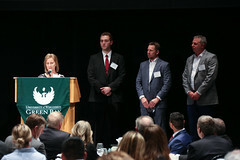 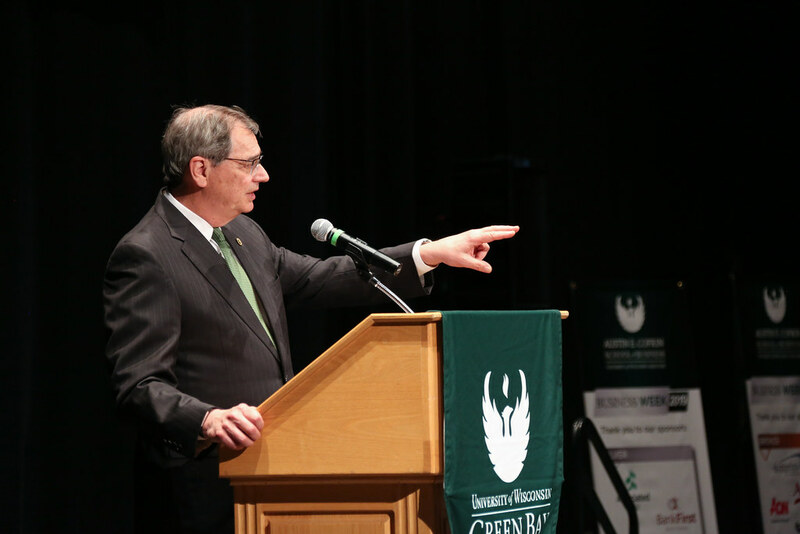 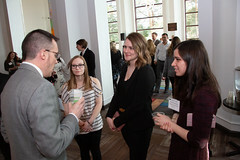 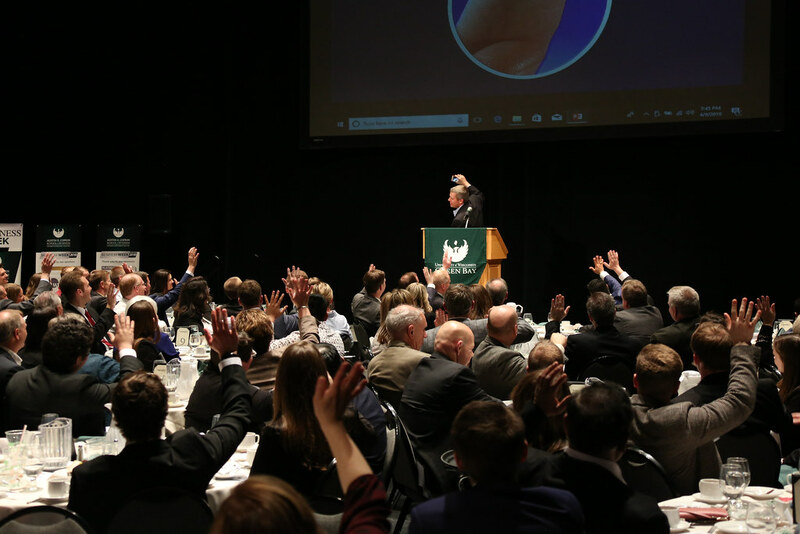 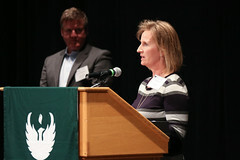 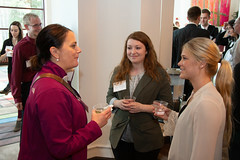 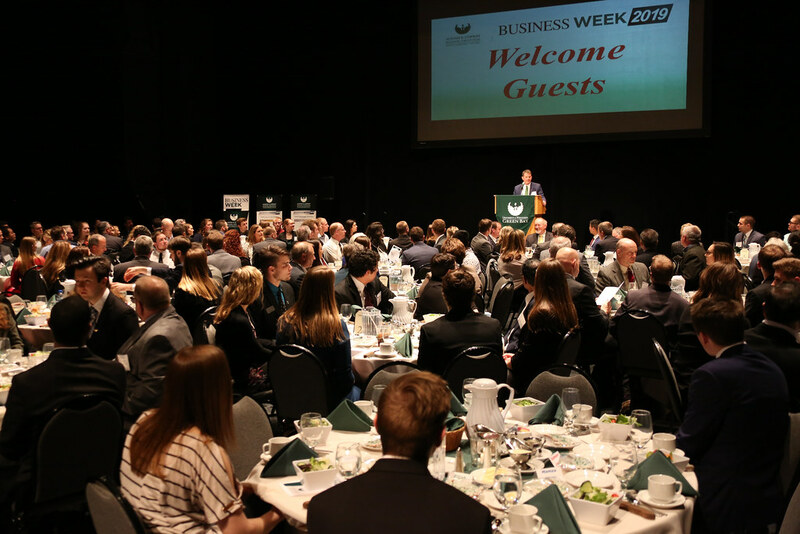 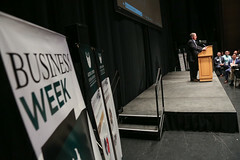 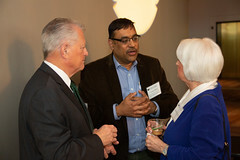 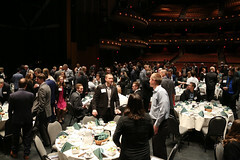 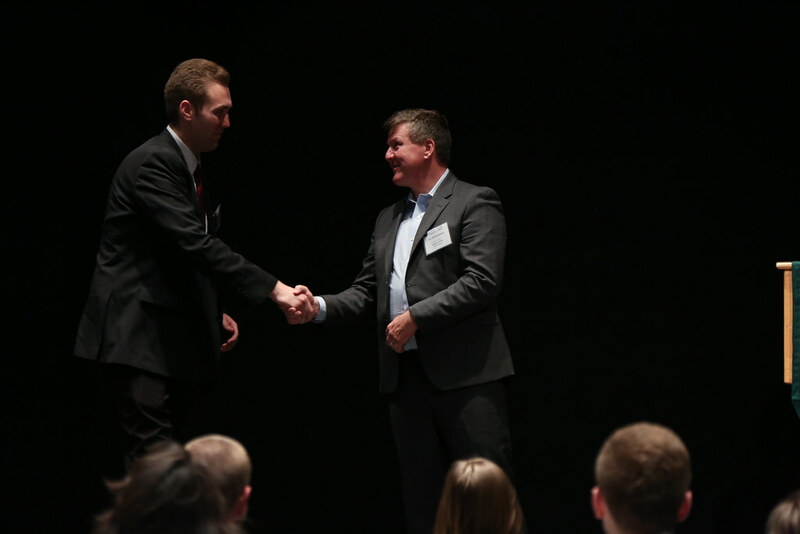 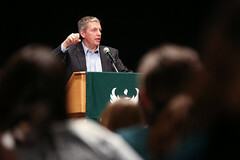 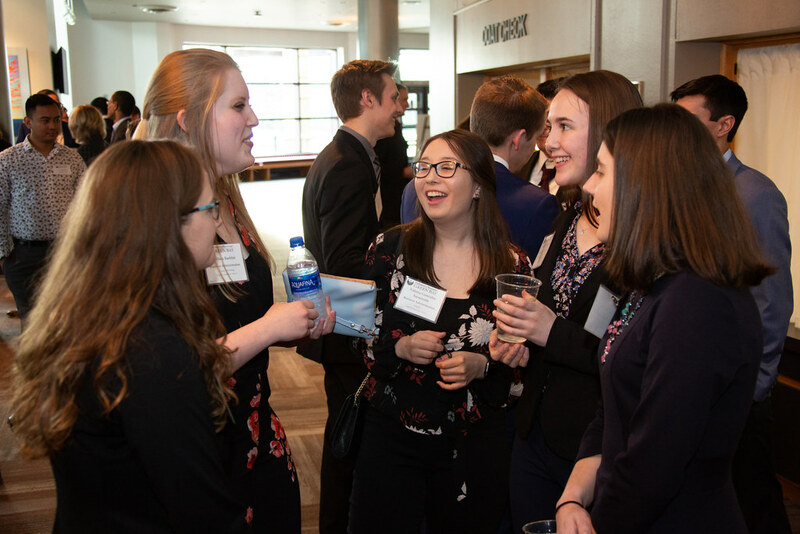 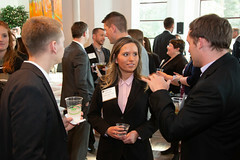 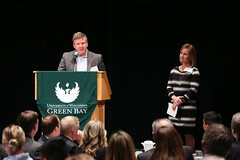 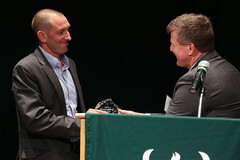 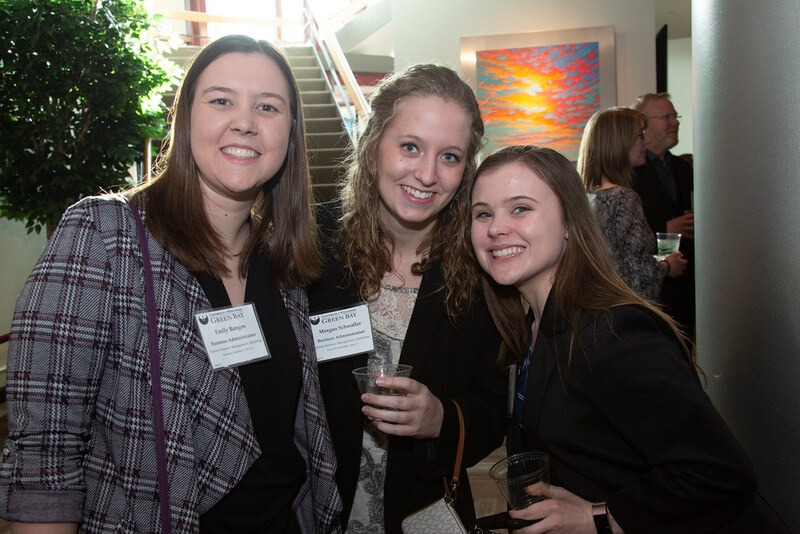 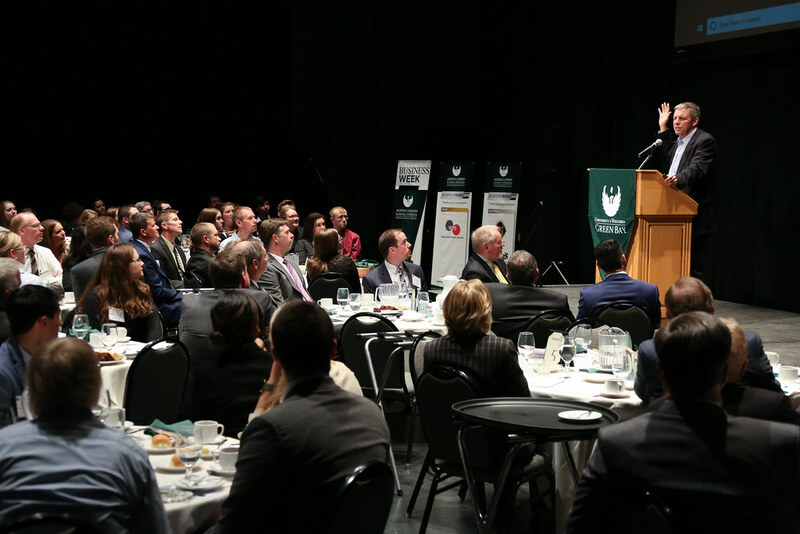 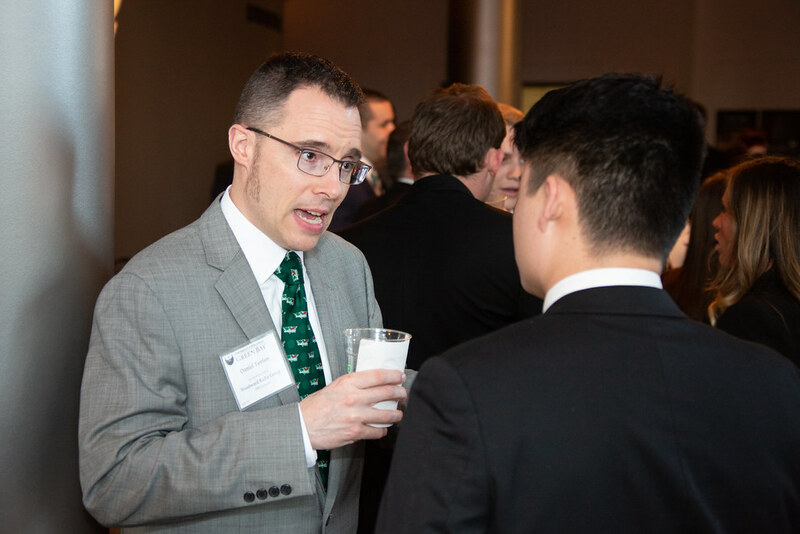 The annual Business Week Keynote and Networking Dinner, Tuesday, April 9, 2019 was the culmination of a series of events over the course of a number of weeks organized by the Cofrin School of Business and UW-Green Bay Career Services. 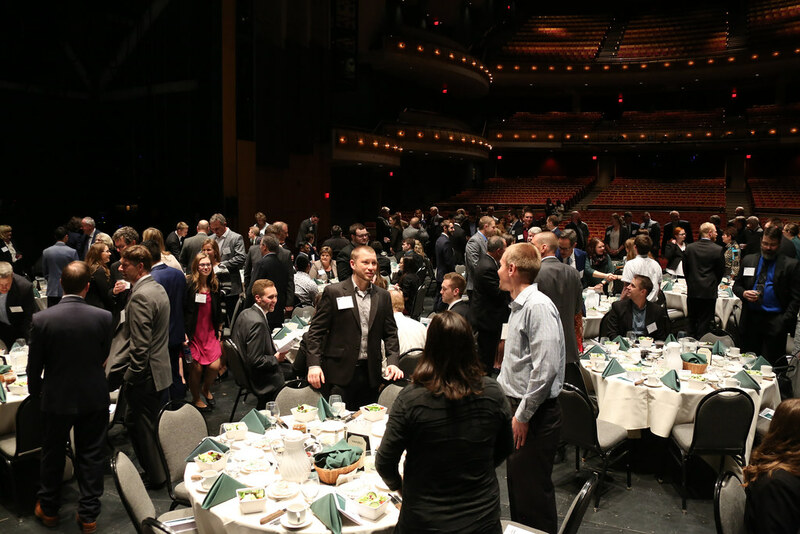 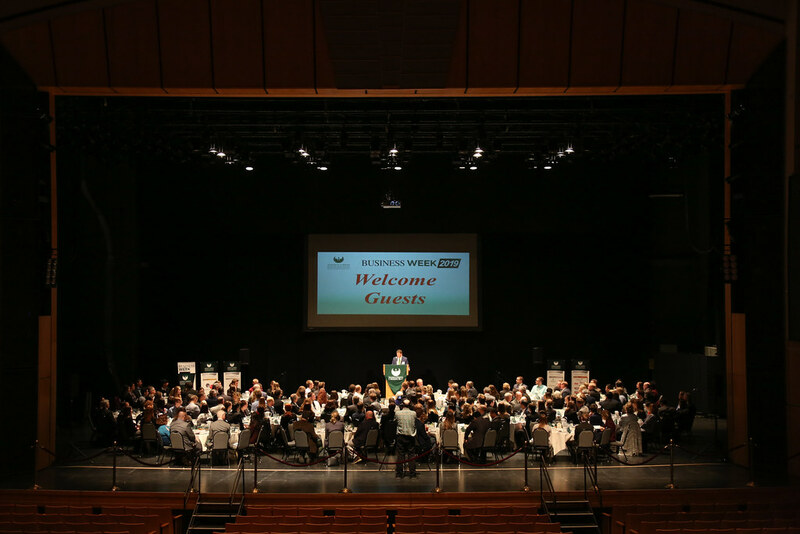 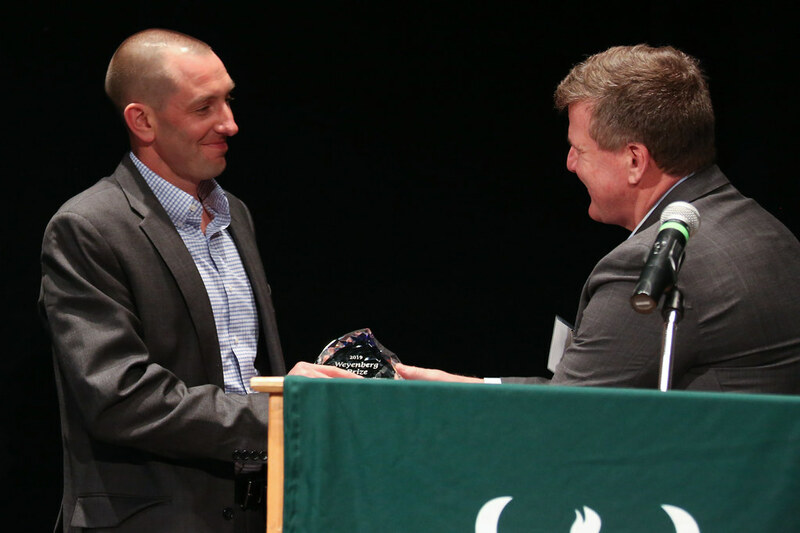 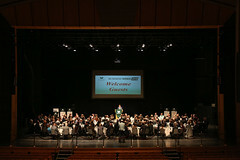 The standing-room only event is held on the Weidner Center stage, and is a venue where business leaders, UW-Green Bay business students, faculty and staff, and community members unite for an evening of networking and celebration. 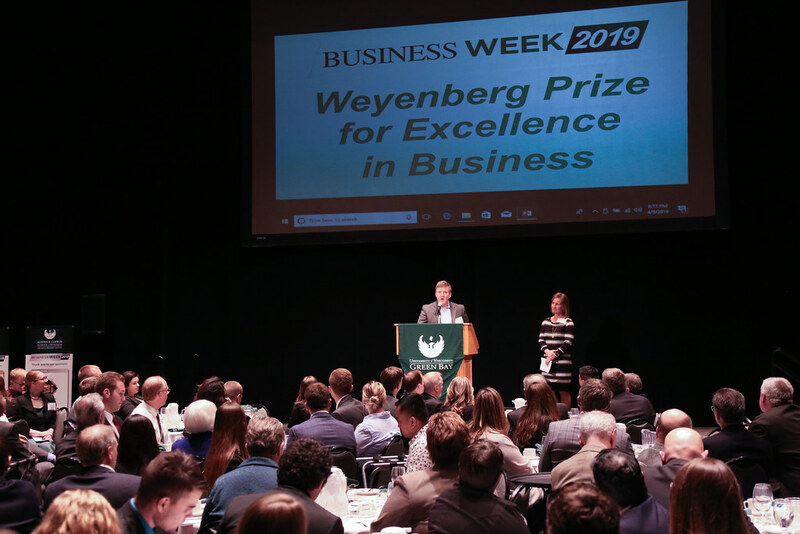 The prize for business excellence is named in recognition of Tim Weyenberg, former CEO and Executive Chair of the Board of Directors for Foth Companies, and first-ever executive-in-residence for the Austin E. Cofrin School of Business. The 2019 Weyenberg Prize is awarded to two deserving companies that demonstrate the three essential elements for business excellence — leadership transformation, strategy and execution. 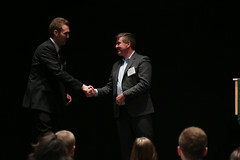 In addition, two separate scholarships of $2,500 each are awarded in the name of the winning companies. 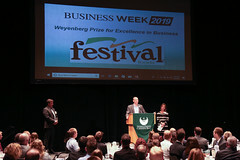 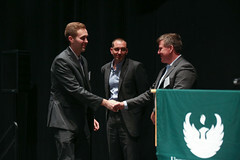 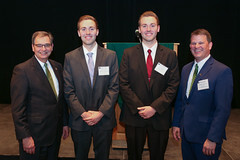 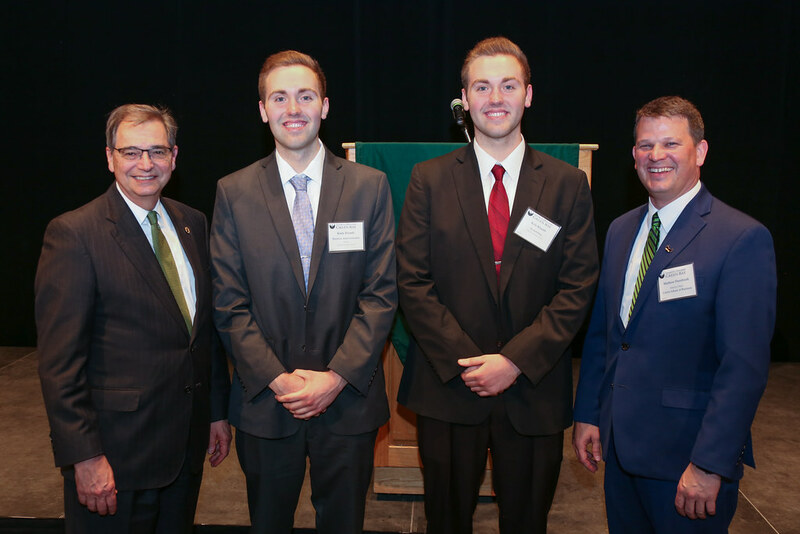 The awards go to the UW-Green Bay business students who best exemplify the spirit of the Weyenberg Prize. 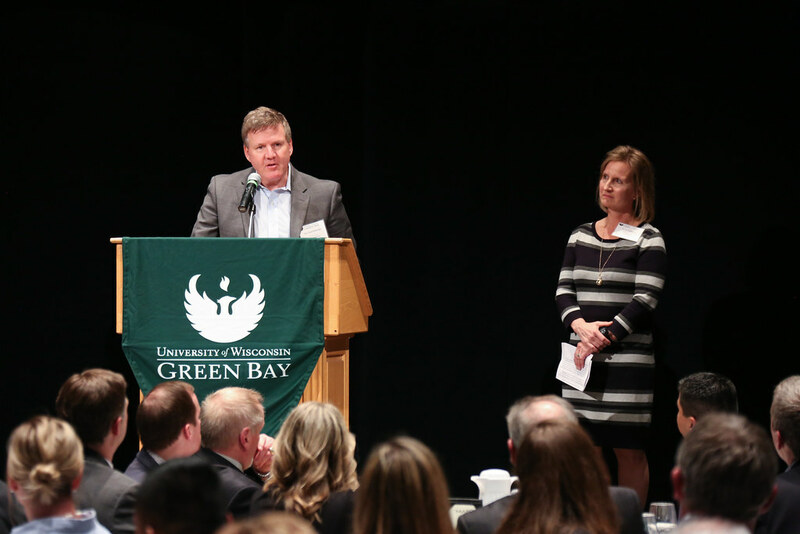 With only $500 of borrowed money and a lot of enthusiasm, Paul and Jane Skogen opened a grocery store in Onalaska, Wisconsin, in 1946. That enthusiasm, along with a service-focused business plan, helped the fledgling company to grow until beginning operations as Festival Foods in 1990. 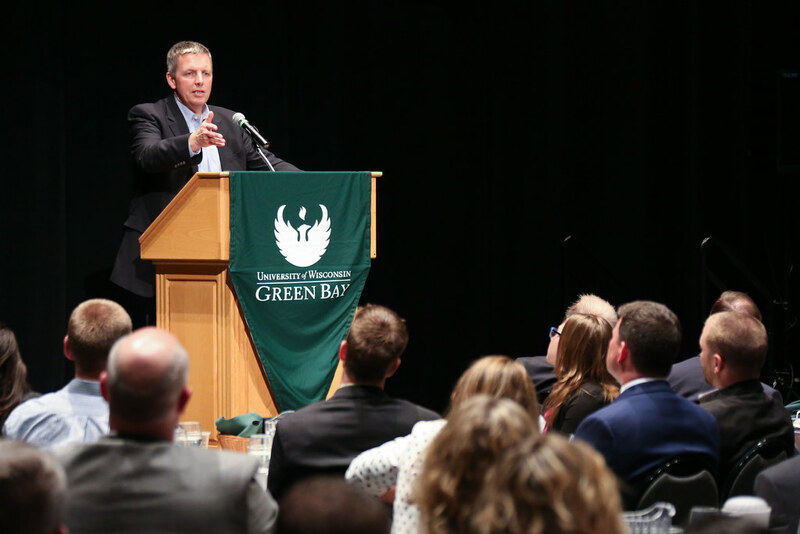 Today, the family-and employee-owned company operates 32 full-service, state-of-the-art supermarkets and employs more than 7,500 associates. 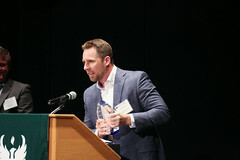 Accepting the award for Festival Foods was Vice President of Store Operations, Frank Abnet. 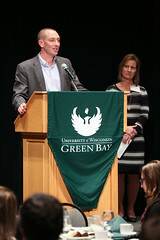 The award includes an accompanying named scholarship to a UW-Green Bay student. 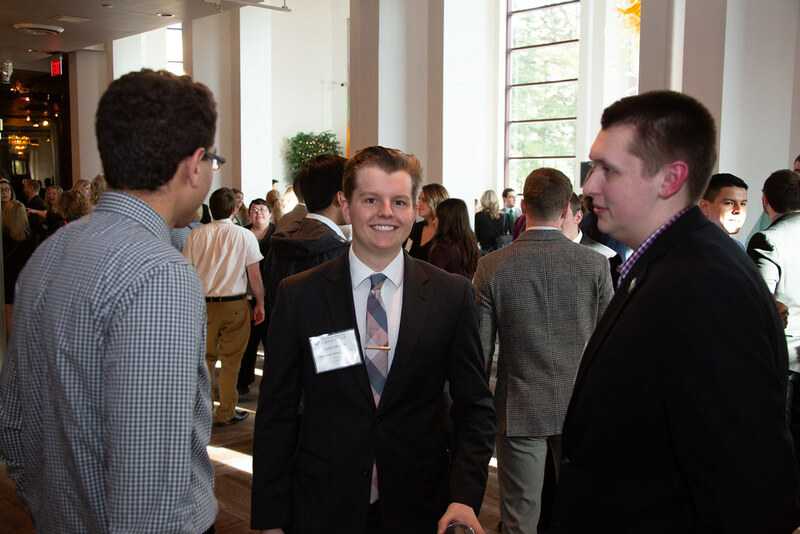 Kody Klumb is a junior from Marinette, Wis. studying Business Administration with an emphasis in Finance. His goal is to become a Certified Financial Planner. He serves as the vice president of the UW-Green Bay Student Finance Association and he is also a Midwest Regional Conference coordinator for the Phi Eta Sigma National Honor Society. 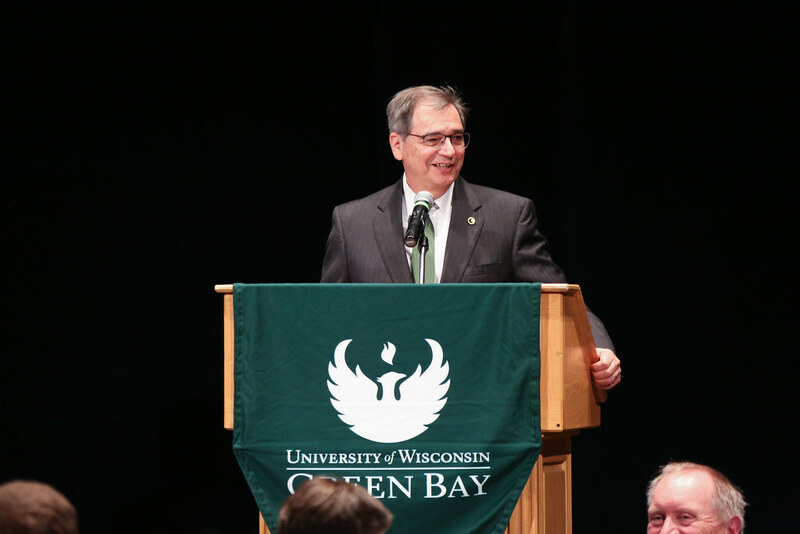 In his free time, he participates in intramural sports and volunteers at local nursing homes. Joseph “Jake” DeLeers began building homes in 1945. 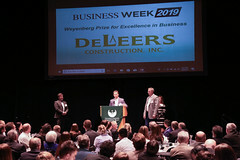 It did not take long for homes built by DeLeers to earn a reputation for precise construction “with no corners cut and no excuses given.” That dedication to quality workmanship inspired Jake’s son, Jerry, to carry on the tradition of quality, ethics and service. 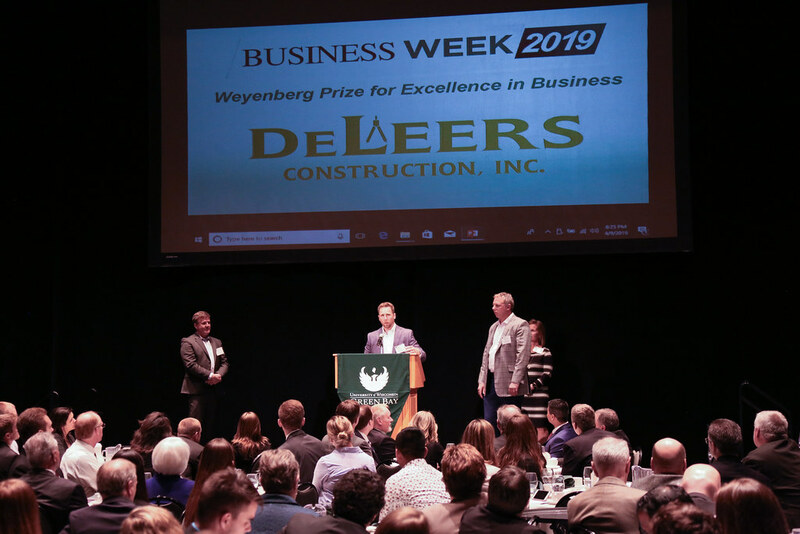 Today, Jerry’s sons, Jim and Paul, operate DeLeers Construction in its third generation with the help of more than 100 employees. 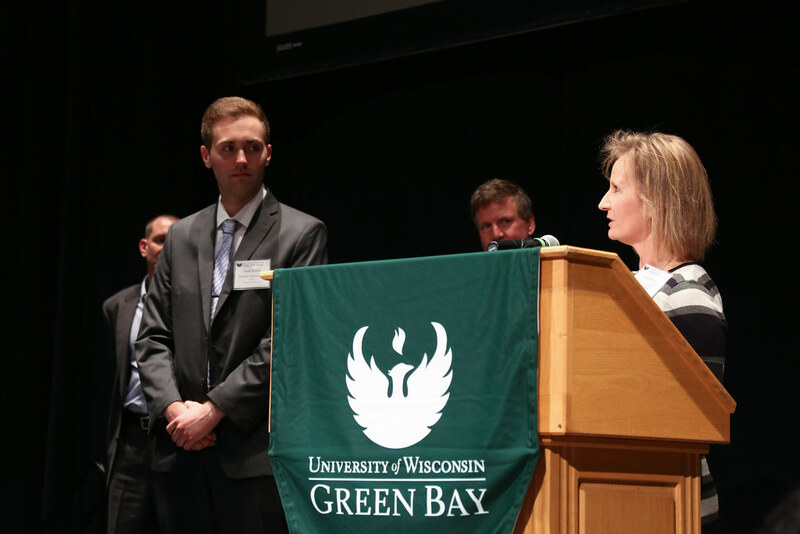 The award includes an accompanying named scholarship to a UW-Green Bay student. 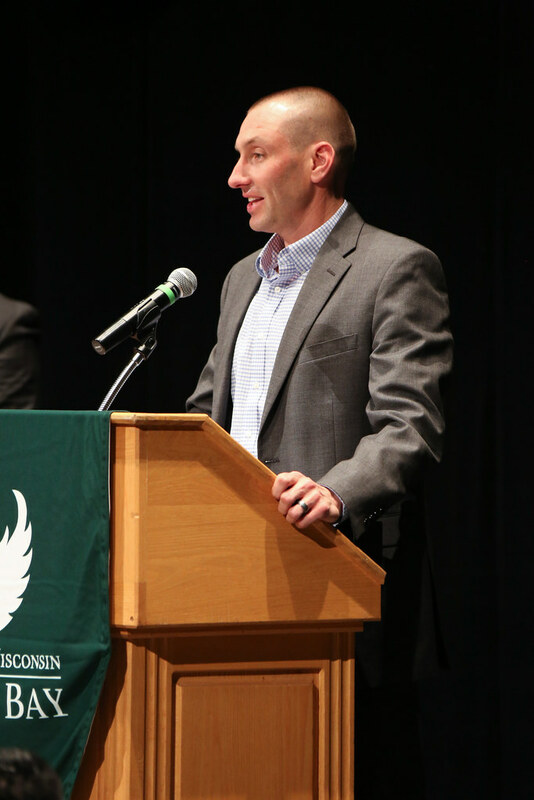 Kyle Klumb is the twin brother of previous recipient Kody Klumb. Kyle is a junior from Marinette, Wis. studying Accounting with the goal of becoming a CPA. He serves as President of the UW-Green Bay. 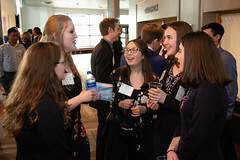 Student Finance Association and is a Midwest Regional Conference Coordinator for the Phi Eta Sigma National Honor Society. In his free time, he participates in intramural sports and volunteers at the Salvation Army. Stuart McKee joined Microsoft as the first U.S. national technology officer in June 2004 and continues his focus as the chief technology officer (CTO) for U.S. state and local government business. 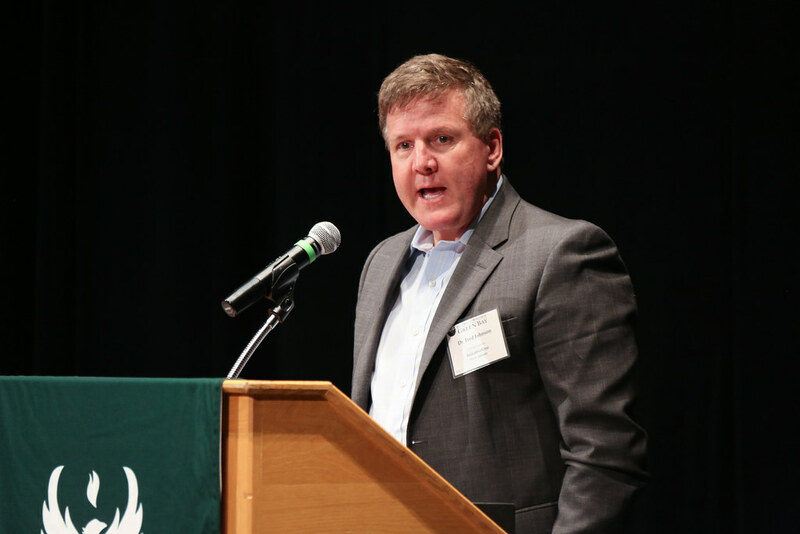 As CTO, he is responsible for driving a comprehensive set of technical and business strategies with both an internal and external focus — shaping and articulating Microsoft’s technology vision and strategy. 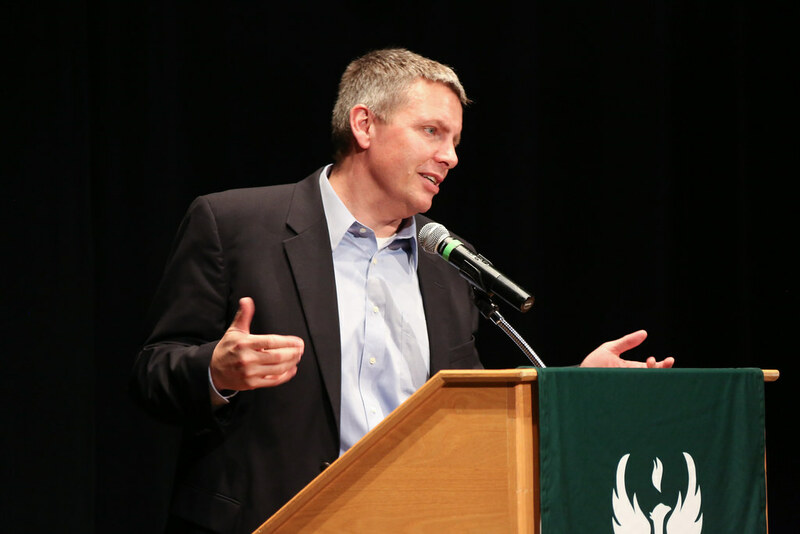 In his tenure Stuart has helped create effective solutions from cybersecurity to public records.